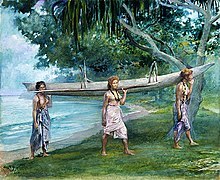 John La Farge 1891 painting of girls carrying a vaʻa at Vaiala, Samoa. Vaʻa is a word in Samoan, Hawaiian and Tahitian which means 'boat', 'canoe' or 'ship'. A larger traditional seagoing vessel for long distance voyages is referred to as vaʻa tele (big ship). The term alia is also used for larger vessels in Samoa. The smaller vaʻa used for fishing typically have a float, or outrigger, attached to the main hull for stability. This outrigger part of the canoe is called ama in various Polynesian languages. The word is cognate with other Polynesian words such as vaka or the Māori word waka. Large single canoes, termed respectively la'au lima (five-barred), or six or seven-barred, as the case might be, were canoes varying in length from thirty, fifty, sixty, and even seventy feet, as required. They were balanced by an outrigger firmly lashed to the canoe on the left side at a distance of three feet if meant for pulling, but of five or six feet if required for sailing. The single canoes have a light appearance, the prow and stern being slightly curved upwards, so that merely the bosom or central part of an unloaded canoe rests upon the water. ʻalia. Samoan double canoe, va'a-tele (the big canoe), was much larger, and consisted of two canoes, one longer than the other, lashed together with cross-bars amidships, and having the thatched shed or cabin built upon a stage that projected over the stern, instead of in midships, as in the Tonga canoes. It was much larger than this canoe, but more difficult to manage, yet able to carry one or two Vaʻa-alo, or small fishing-canoes, on deck as required. Typical Vaʻa with outrigger for fishing, Savai'i Island, Samoa. A main hull of a vaʻa can be made in one piece, from a hollowed out trunk of a large tree with the ama float attached later. Other types of Polynesian construction include 'sewing' planks of wood together with special cords and ropes, a type of hand made sennit, important in the material cultures of the people of Oceania. Wikimedia Commons has media related to Va'a. ^ Pratt, George. "Title: A Grammar and Dictionary of the Samoan Language, with English and Samoan vocabulary, NZ Licence CC-BY-SA 3.0". NZ Electronic Text Centre, Victoria University of Wellington. Retrieved 19 November 2010. ^ Barclay-Kerr, Hoturoa (22 September 2012). "Story: Waka – canoes – 'Waka taua' Te Ara". Te Ara: The Encyclopedia of New Zealand. p. 3. Retrieved 12 January 2015. This page lists people with the surname Va'a. If an internal link intending to refer to a specific person led you to this page, you may wish to change that link by adding the person's given name(s) to the link.